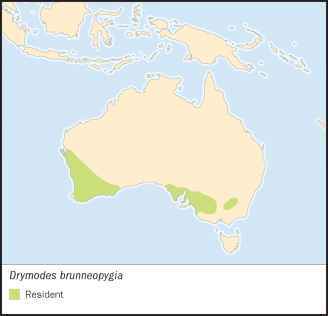 Drymodes brunneopygia Gould, 1841, Murray River, South Australia. French: Drymode a croupion brun; German: MalleeScheindrossel; Spanish: Tordo de Lomo Castaño. 8-9 in (21-23 cm); 1.25-1.35 oz (36-38 g). A large bird with white to buff underparts, dark brown wing and light gray-brown upperparts with white-tipped tail. Southwestern Australia, south-central Australia into western Victoria and southwestern New South Wales. Mallee, especially with broombush (Melaleuca) or heathy un-derstory; other semiarid scrub; coastal tea tree thickets. Shy and often hidden, heard more often than seen. Territorial year-round. Flicks or gently raises and lowers tail. Call is a thin "pee...pee" or a musical "chip...chip...par-ee." Forages entirely on the ground, gleaning insects, especially ants, termites, and beetles; occasionally picks fruit from low shrubs. 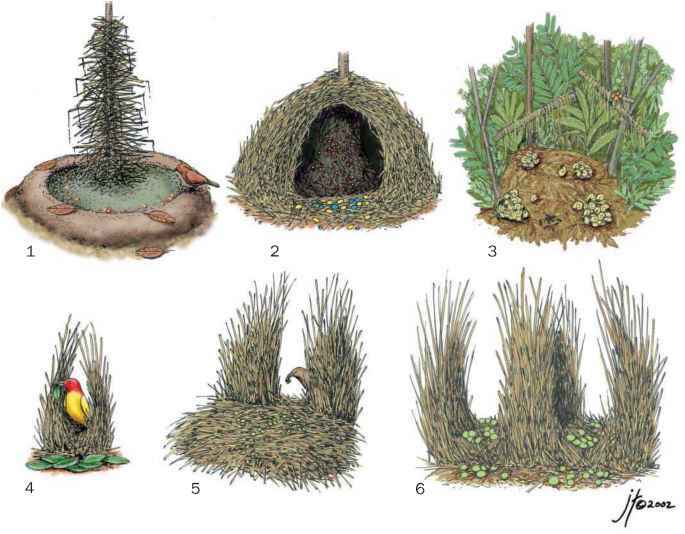 Breeds from July to December, building a cup-shaped nest that is placed on or near ground. Clutch is comprised of one pale green egg, blotched with brown and black. Female builds nest and incubates the egg for 16 days. Both sexes feed the young bird, which fledges at nine to 12 days. Nest success was 64% in Western Australia study. Male whistles and draws predators away from the nest. Not threatened. Common in suitable habitat but has declined due to extensive clearing of mallee for agriculture.